Sash window repair lower rail splice required. 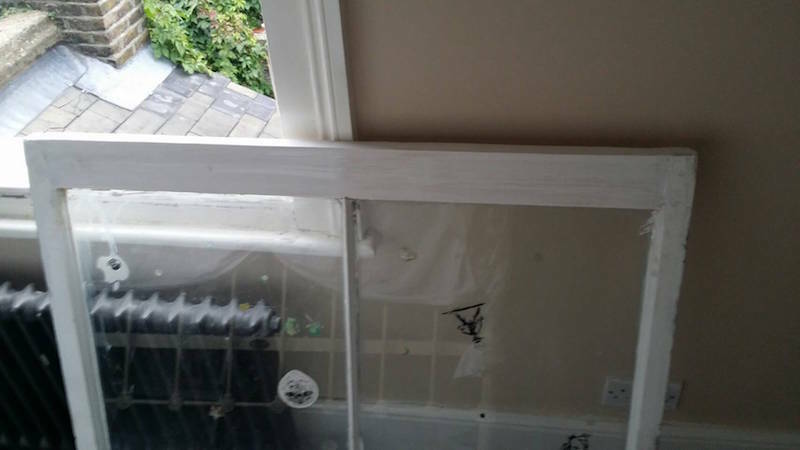 In this Earlsfield near Wimbledon case study we replaced the lower rail of a sash window that was in pretty poor condition, in fact it was one of the worst cover ups I had seen in a while. We also refurbished several sash windows and installed draught proofing systems. These sash windows are amongst some of the least maintained we have worked on in a while. This happens often when a property is a rental and then subsequently sold to a caring family who wish to bring the property up to it’s full potential. In this example we do not show any double glazing. If you’d like to learn about our London double glazed sash window services. The sash windows in this example needed removing, sash rails replacing, and then draught proofing. The windows were poorly fitted, had broken sash cords, the sashes were also stuck in places. In general they really needed a good overhaul and draught proofing system to get them up to scratch. Several windows also needed significant sash window restoration work. 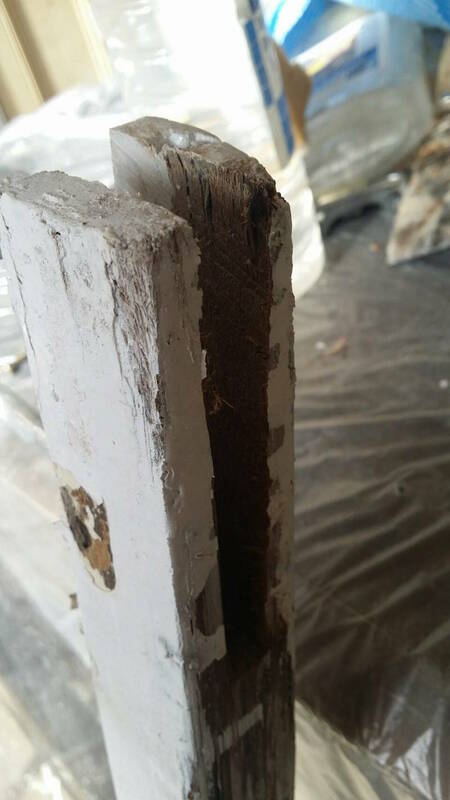 Please take a look at the image below – the sash doesn’t look all that unhealthy, it’s just got an L-bracket screwed on the mortise and tenon to hold things together securely. Sash window lower rail before splicing and sash window repair. Well unfortunately this is the tell tale sign of something far more sinister. 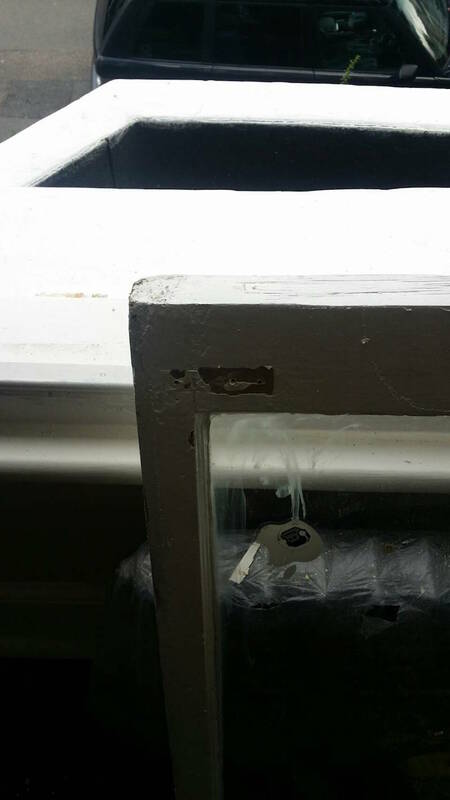 This sash window lower rail had literally been repaired no less than 3 or 4 times by a handyman patching it up. 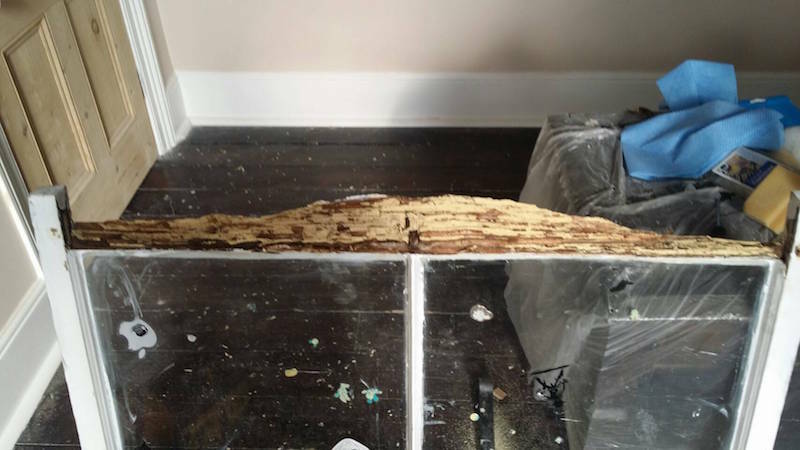 This is very dangerous and will lead to dry rot. Fortunately for the client in this situation, the window is in poor condition however still just about worth salvaging. Things could be a great deal worse however. If the stiles of the sash were rotten as well then we would of had no choice but to replace, which seems a shame considering the rest of the windows are the originals. Sometimes a neglected home is a good one because most of the original features haven’t been tampered with! Anyway, let’s take a look at this handyman repair work and what was left of the sash when we pulled it out. I really wish I had take a picture of all the filler just sat there in one huge chunk. I’m sure you can get the idea though from just looking at the rail! Remarkably the sill sections on this property were in excellent condition. Despite the sash literally being rotten from front to back, the sills stood up. that is quite impressive and certainly a testament to the quality of timber a hundred years ago. It’s quite amazing to see how well timber will last when protected. Talking of protection I do believe that the sills were covered in lead paint and although toxic, nasty stuff, it really does the job of sealing in the sills. It’s almost the same as having a metal coating all over your windows! Earlsfield and Wimbledon sash window restoration, lower rail replacement, and draught proofing. So we set about removing the rest of the lower rail (which wasn’t all that difficult considering it was all but falling off anyway) and then carefully inspected the stiles. They were not the in the best of condition, although if you look carefully they are not rotten so we decided to proceed with repair. Sash window rail spliced out ready for rebuilding the lower sash. The first step was to treat the timber thoroughly with Cuprinol Fiver Star. This is your best friend when it comes to window preservation. It’s toxic – do not breathe it in, it’s designed to kill off wood decaying bacteria. It’ll have the same effect in your lungs so you’ve been warned if you decide to decorate yourself and spot a patch of rot/decay, this is the right treatment, just needs handling with care. You can see more sash window lower rail splice and replacement examples here. So with the lower rail removed we then install a new rail, fill the joints with epoxy resin, and then sand. Then once cleaned up a bit we will prime and undercoat to seal in all the new repairs. Depending on whether or not you have us decorate or do this yourself we would at this point clean back all the glass as part of our restoration and decoration service. The client wanted to decorate themselves which is brilliant because there is good savings to be made if you have the time and we’ve put together a comprehensive how to decorate sash windows for this situation. The sash was put back in the condition you can see in the image below. Sash window lower rail replacement primed and undercoated. It certainly needs a great deal of tidying up decoration wise, however structurally it’s sound and the window is fitted back with a comprehensive draught proofing system. More detail and information on draught proofing windows are highlighted here. Once all is decorated you wouldn’t know the windows have been restored and rails replaced. If you’d like to see an example of the entire London sash window decoration process please take a look at the link provided.